How Did Jennie Bharaj’s BasedGamer.com Meet Its Funding Goal? Home How Did Jennie Bharaj’s BasedGamer.com Meet Its Funding Goal? Sam Roberts is the ethics officer for Reaxxion. Think we're doing something wrong? Want to chat? You can follow him on twitter, or email him from our ethics policy page. 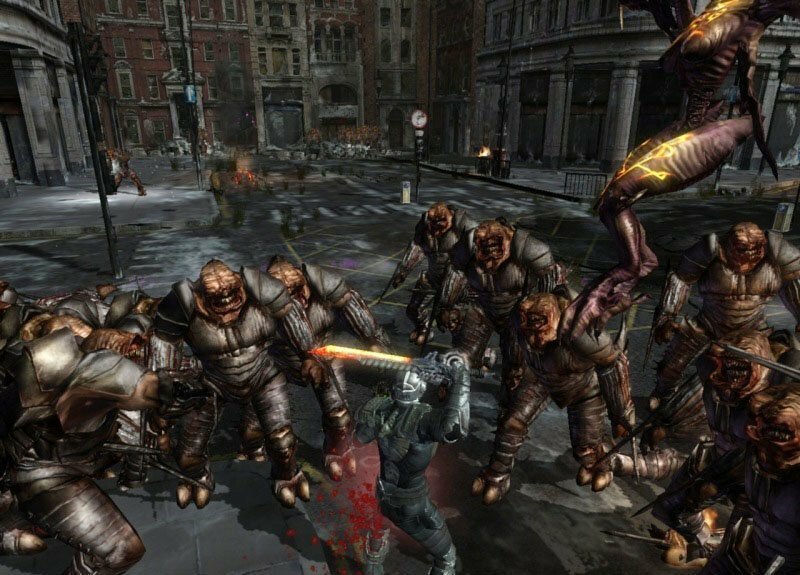 As of Wednesday, BasedGamer.com, the site which I wrote about for my very first article here at Reaxxion, reached its funding goal of 50,000 dollars. This comes after an initially failed campaign which caused them to push back the deadline several weeks. Before the campaign deadline was extended, BasedGamer had only raised approximately $20,000, less than half of its goal. Followers of crowdsourcing campaigns know that it’s very unusual for one to succeed after a poor start like BasedGamer had. How’d she do it? How did a campaign that seemed for all the world to be failing suddenly generate all this money in such a short time? Did Jennie Bharaj fund her own campaign? Well, this is a very good question. Thankfully, Indiegogo provides a full accounting of who donated what, and when. On the 7th of January, she started receiving absolutely massive donations from people who had never donated to an IndieGogo campaign before. “Manpreet Singh Sandhu”, “S Z” and “Simran R.” All donated within the span of 48 hours a total of $13,000, more than a third of what the campaign needed to complete its goal. It’s reasonable to assume that these are friends and relatives of hers (Indeed, Simran R’s left a comment to the effect of “Hey Sis!”), presumably with very deep pocketbooks. But this raises a question: where were these friends during the original campaign, before the deadline was extended? It seems exceedingly strange that three separate people would suddenly become willing to donate such large sums of money over just a few weeks. I’ve looked over Ms. Bharaj’s twitter, her Youtube page, and the BasedGamerTeam twitter as well, and if there was some major event that prompted these donations, it’s escaped my notice. There was a twitch.tv stream of some video games, including “The Evil Within”, but nothing more than that. No major celebrity seems to have covered her. There were no big write-ups. There’s no obvious reason for this sudden surge of attention. Anonymous donors are in red. Note the large number at the $200 range. By contrast, only 175 of the 673 people who donated smaller amounts did so anonymously. This comes out to around 26%. People who donated less money were almost half as likely to do so anonymously. It seems strange that people who are willing to pay so much money aren’t even willing to pick a name. And what’s even stranger, almost half of these donors didn’t even bother to pick a reward! The $200 reward tier in particular, where most of the anonymous donations are concentrated, is extremely unusual. There were 22 donors eligible for this tier. The $200 reward tier, however, was only claimed by 10 people. It’s entirely possible that not a single anonymous donor at that tier bothered to pick a reward at all. Note the number of claimed rewards at the $200 tier. One explanation for this strange behavior is that these repeated anonymous donations came from Ms. Bharaj herself, or someone else at the BasedGamerTeam. But why would she donate to her own campaign? 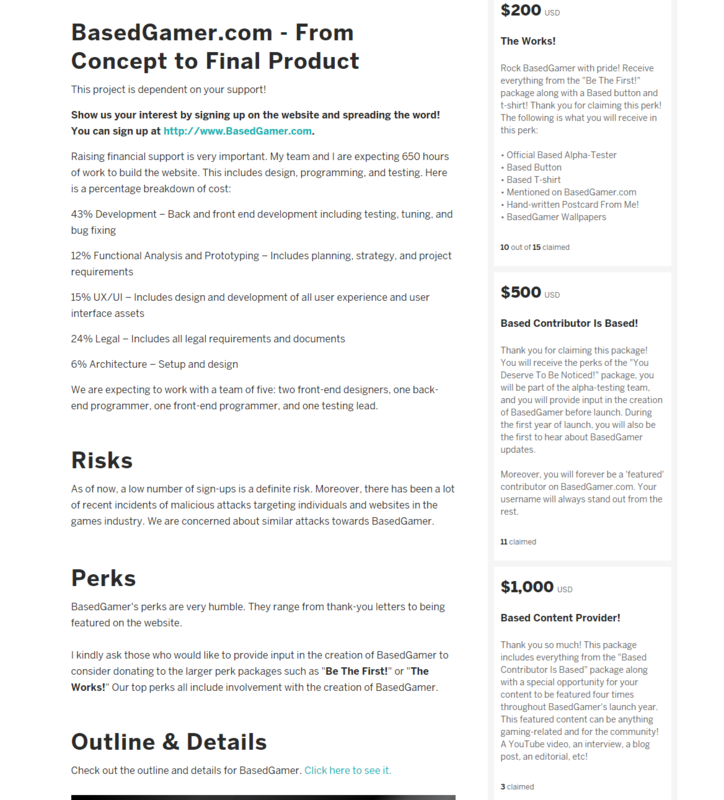 The BasedGamer Indiegogo campaign was what’s called a “Fixed Funding” campaign. Indiegogo allows you to run what’s called a “Flexible Funding” campaign, where regardless of whether or not the campaign fails you still get to keep all the money donated. Many people are reluctant to donate to a Flexible Funding campaign, however, so they also offer what are called “Fixed Funding” campaigns. With a Fixed Funding campaign, however, you only get the money if you reach your target goal (In her case, $50,000). If you fail, as BasedGamer was going to originally, you get nothing. Is it possible that these strange, large donations are an attempt by Ms. Bharaj to collect the money from a failing crowdsourcing attempt? Until seven or so days ago, BasedGamer was a failed project that had raised less than half the money it needed. But all of a sudden she was very close to meeting her goal, and was able to take advantage of the excitement and positive press that comes with a crowdsourcing campaign that just needs a little push to make it over the edge. Anonymous donations over $200, as well as the donations of greater than $3,000 that she received from “manpreet singh sandhu”, “S Z” and “Simran R.” came to total of $18,000. This is a hefty sum, to be sure. But thanks to them, Ms. Bharaj received a total of $52,619 (minus a small percentage from credit card processing and Indiegogo’s own fees.) This is a significant return on investment, and more than enough to justify some skulduggery. I verified with IndieGogo via Twitter that they don’t prohibit donating to your own campaign, so even if this is true there’s very little to be done about it at this point. But this is a very odd start for a site that’s trying to ride on the shoulders of movement about ethics in gaming journalism, especially one that has had so many criticisms leveled against it. I would like to emphasize at this point that I have no information on this subject beyond what I’ve shared above. I don’t claim to be any expert on Kickstarter or IndieGogo. This post originally began as a simple news update regarding a successful crowdfunding project of interest to the #Gamergate community. As I said in my original article, I have many questions about the viability of BasedGamer as a project, but I am a believer in the right of people to spend their money where they wish. If the community felt that BasedGamer was a good use of its money, I am more than happy to defer to its judgement. In the course of writing that post, however, I noticed these things that seemed really strange to me, and decided to share them with you all. I strongly urge you to come to your own conclusions. Is this a simple coincidence? Is there nothing to this at all? Or is something going on here? 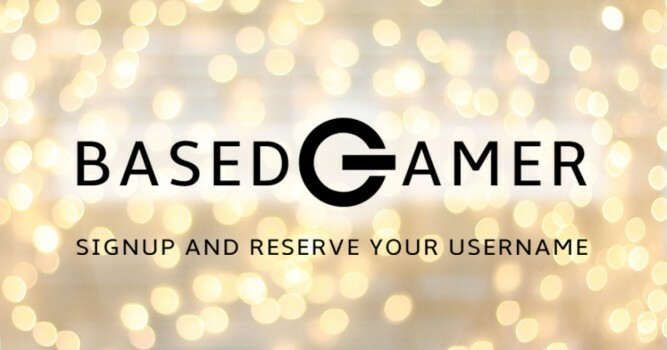 It’s also possible that Ms. Bharaj is so passionate about this project and making it a success that she is ready to put her money and that of her friends and relatives in to BasedGamer. This could be the ‘skin in the game’ necessary to the site’s successful development. I would really like to be proven wrong about this. As counter intuitive as it might seem, I would really like Basedgamer to be a success. I believe that the more sites we have on the “#Gamergate Side”, sites like The Ralph Retort and Gamergate.me, the better off we all are. Gamergate wins when it creates an ecosystem of its own, one that doesn’t have to rely on biased sites like Polygon or Kotaku, and a replacement for Metacritic would go a long way towards establishing that ecosystem. Ms. Baharj’s team now has more than enough money now to build the site they’ve envisioned, and I hope to see it up and running soon. It’s possible that it will be a valuable resource to the gamergate community in the months and years ahead. I remain, however, skeptical, and slightly concerned. 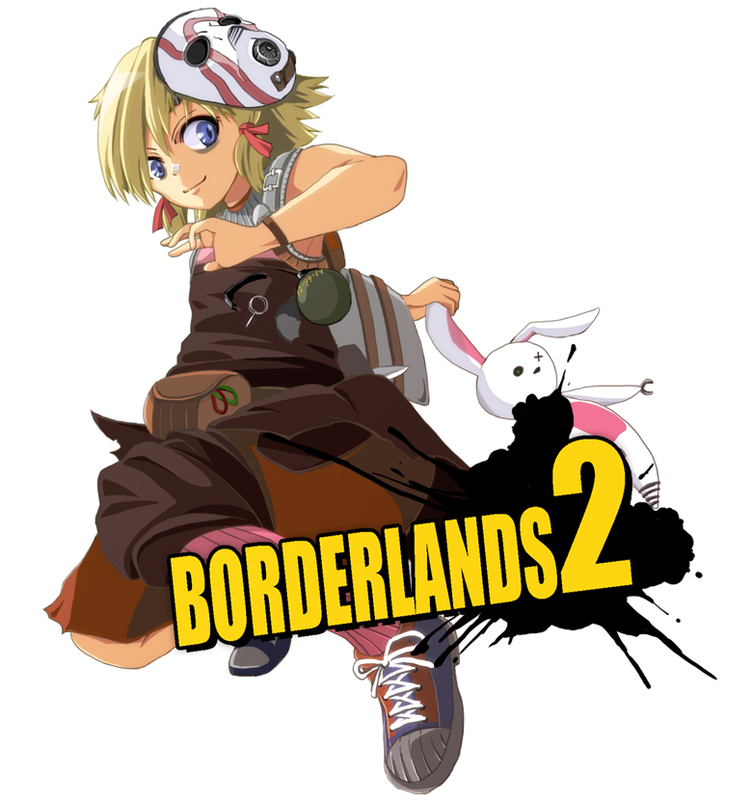 What If Borderland 2’s Tiny Tina Was Black?